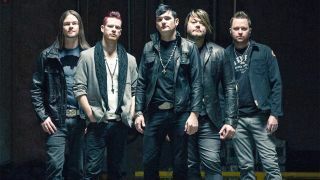 Hinder are to release their acoustic EP Stripped on May 13. The record will feature five acoustic versions of original Hinder songs and their cover of Not An Addict by K’s Choice. The Oklahoma outfit also announced a string of 22 shows in the US with Like A Storm in June. Hinder say: ”We are going back out on the road with our friends Like A Storm from June 3 to July 3. We are so glad to be touring this great country in the summer and seeing a ton of familiar faces.